Following #GivingTuesday, Facebook held its second annual Social Good Forum, where it announced new tools and initiatives that can help people keep each other safe and supported. Facebook has become a lot more than a social network. Apart from being the biggest network in history, its is committed to using its tremendous power to help communities do more good together. In this vein, there are many tools that users and nonprofits can use to do good and help others. Similarly, inspired by all the good that people already do on Facebook, the company offers many initiatives that provide support and help people continue their efforts. Facebook announced this new product that offers a guided program developed by nonprofit organisations, allowing mentees and mentors to come together, to connect, and to interact directly with each other. The program helps mentors and mentees work through a step-by-step program on Facebook, tailored to the mentees’ needs. Facebook announced that now, 100% of donations that were made through Facebook payments to nonprofits will go directly to the organisations, as the company is removed the 5% fee that would usually go to Facebook to run its program. Also, Facebook announced it Donations Fund, a $50 million annual fund that will help community-recovery in 2018. The fund will match direct contributions, increasing community support following natural disasters. It will also help people support causes they care about most, as Facebook matches contributions from supporters. 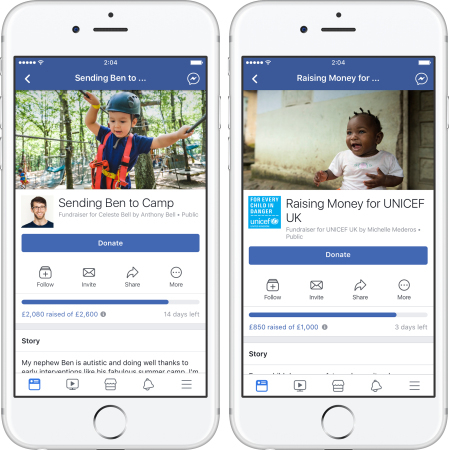 The latest example of this being put into use is when Facebook and the Gates Foundation matched the $2 million raised by the Facebook Community on #GivingTuesday. Charitable giving tools are being expanded to other areas globally. Nonprofit fundraising tools like donate buttons and the ability for nonprofits to run fundraisers will not also be available in the United Kingdom, Ireland, Germany, France, Spain, Italy, Poland, the Netherlands, Belgium, Sweden, Portugal, Denmark, Norway, Austria, Finland, and Luxembourg. Also, people who want to set up their own fundraisers can do so in many more countries. Personal fundraisers are now available in the United Kingdom, Ireland, Canada, Australia, Germany, Spain, Italy, Netherlands, Belgium, Portugal, Austria, Finland, Luxembourg, Sweden, Denmark and New Zealand. The API will be rolling out to 500 additional nonprofits by the end of spring 2018 and will be available to a few nonprofits for the time being. The new tool will give disaster response agencies and organisations access to Community Help data, allowing them to access “important information about the needs of people affected by crises so that they can respond.” Gleit explains that Facebook is currently piloting the API with NetHope and the American Red Cross initially, but hopes that its data will help other organisations coordinate their efforts in response to crises. Facebook launched a blood donations feature in India just over a month ago, and now there are over 4 million donors who have signed up. The feature has made it significantly easier for donors to donate blood, but now hospitals, blood banks and nonprofits can also create blood donation events on Facebook, and notify nearby donors. The blood donations feature will expand to Bangladesh in early 2018. Facebook offers many initiatives that provide support and help people continue their efforts.